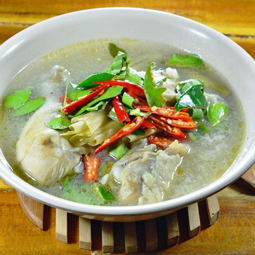 Thai Coconut Chicken Soup - A recipe from Savor California, the online showcase for extraordinary gourmet foods and beverages from California. Heat 3 tablespoons La Tourangelle Thai Wok Oil over medium-high heat. Stir fry the chicken meat in a large pot. Add fish sauce, ginger, fresh lime juice, cayenne, turmeric and sugar to the pot. Then add half the mushrooms and the chilies and cook for 5 more minutes. Pour the chicken stock and coconut milk into the pot and bring it to boil over medium heat. Sprinkle with 1 tablespoon La Tourangelle Thai Wok oil, and top with remaining mushrooms, green onions and cilantro before serving.